Until recently birds were underestimated, even by biologists – “bird-brained” was by no means a complimentary term – but opinion is gradually changing as publications such as The Genius of Birds by zoologist Jennifer Ackerman help us reassess our feathered friends and appreciate their amazing, avian abilities. Take for example the Japanese crows that use cars to crack nuts. When the light at a pedestrian crossing has turned red, the crows take the opportunity to place their nut carefully on the crossing. As the light turns green, cars will run over the nut, which is then retrieved by the crow at the next red light, its shell broken. Even on a smaller scale many birds use tools: there are finches who fashion skewers from twigs to fish grubs out of inaccessible nooks, and there are rooks who can work out that they should drop pebbles into a vessel of water to raise the level so they can reach a floating morsel of food. The miraculous navigational system, which allows birds to migrate tens of thousands of miles half way across the globe to better feeding grounds each winter, is well known. During the world wars, pigeons’ ability to navigate home over unknown terrain from 1000 miles away meant they could safely carry messages back to base from behind enemy lines. Even now the Chinese currently have a force of 10,000 pigeons trained to carry messages between troops in the event of electronic communications failures. Birds are no slouches in the memory department either and the chickadee in particular takes some beating: during Autumn it hides thousands of seeds, all of which it will retrieve in the winter when food is scarce. Its brain actually grows bigger to accomplish this feat of memory and then shrinks back again for summer months. Then there is the disturbingly Hitchcockian story of the ornithologist who was targeted by revengeful crows when he returned to his research lab after an absence of many years. Recognising his face, the crows dive bombed mercilessly. Time had not made them forget being captured for experiments. A particularly enviable trait is the avian propensity to sleep with one eye open i.e. resting half the brain at a time. No intruder will get past in the small hours and some birds even carry on flying through the night, closing one eye at a time on the wing! Bowerbirds are artistic architects creating elaborate structures that defy belief. Only the male who has built the most symmetrical bower with ornaments arranged by colour and size to create an illusion of depth, will be picked as a potential mate. This must surely be one of the best examples of Art in the entire animal world. 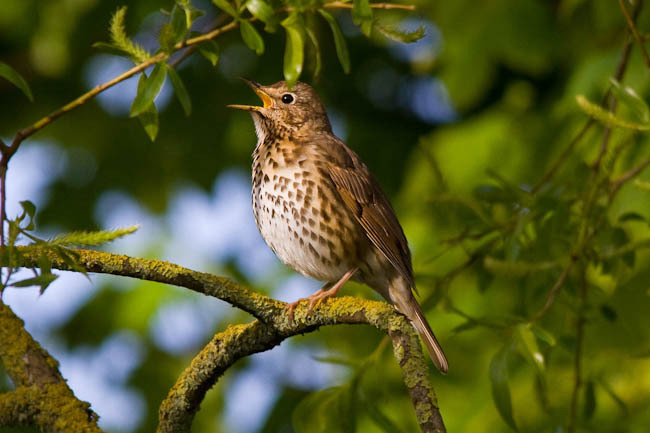 This summer I was excited to hear a song thrush performing in the top of the trees near my house. The sheer volume of sound from such a tiny creature was dazzling, as he mixed elements of the Radetzky march with trills, scales and intricate repeated motifs, all sung purely for the joy of living – and in the off chance of impressing a female. I for one was certainly seduced by this lesson in music and life!